XB-8000 consumes very low power which makes it most effective when power is limited in resource or needs to be conserved. While cruising, the XB-8000 sounds the alarm in case of a potential collision or a man overboard situation, even when all other equipment like MFDs or mobile devices are switched off. While at anchor, you can sleep soundly knowing fully well that the smartAIS transponder watches out for anchor drag or man overboard situations and sounds the alarm without needing any other equipment. 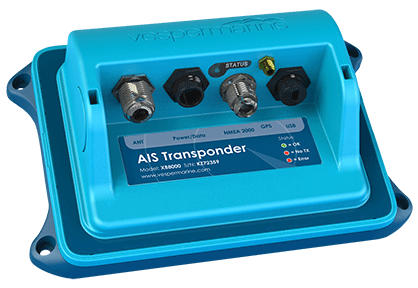 Vesper Marine's transponders are also compatible with a wide variety of mobile, and tablet applications. "The best black box a boater can buy"
smartAIS computes the closest point of approach and time until CPA. A CPA alarm is triggered if a vessel will come too close in terms of CPA and the alarm is prioritised by TCPA. Alarms are presented in priority order of collision risk. Choose from multiple profiles according to the current situation (Offshore, Coastal, Harbor or Anchored) and the profile defines the distance notifications for alarms. If your Anchor position needs fine-tuning after you have marked it, you can do that with the Move Anchor Position. XB-8000 plots your position in relation to the anchor and marks your positions over time for easy visual identification if you are dragging. Besides AIS data, GPS and NMEA instrument data can be shared with all your mobile devices and laptops. 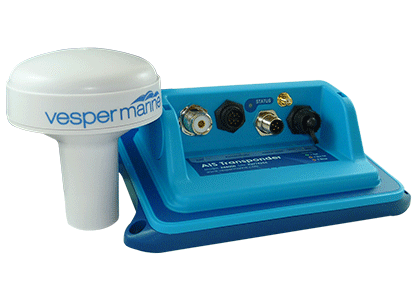 This is exclusive to Vesper Marine smartAIS transponders. Manage your vessel’s navigation, set and monitor alarms or take decisive action from anywhere on-board using your mobile device. All NMEA 2000 navigation data is combined with GPS and AIS data and sent simultaneously to up to five WiFi devices (tablets, smart phones, computers) as well as computers via USB. 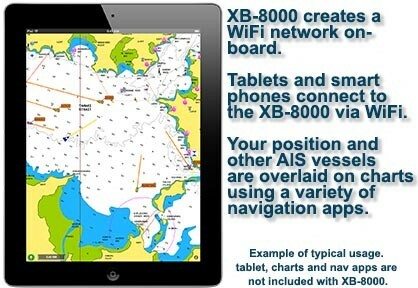 Display and use this data in your navigation applications such as NavPlay, iNavX or SEAiq on an iPad. Or use Android apps and Windows or Mac navigation software. An external GPS antenna connection is provided with the WatchMate XB-8000. The WatchMate App is the only mobile app with instant identification of other vessels. All other apps and MFDs take time for AIS targets to appear, but the WatchMate app takes advantage of unique NMEA gateway capabilities of your WatchMate XB-8000, so it displays all received vessel information the instant you start the app. Activate the Anchor Watch on your WatchMate XB-8000 from anywhere on your boat. Monitor your position relative to the anchor location on your Apple or Android phone or tablet and receive alarms wherever you are on board. WatchMate XB-8000 has an upgradeable AIS platform, designed to be compatible with a continuous stream of feature updates. You can automatically update your WatchMate XB-8000 with the latest firmware using your smartphone or tablet and the WatchMate App. Or online at support.vespermarine.com.